A full colour map of the Shropshire Union Canal suitable for both waterways and leisure users. 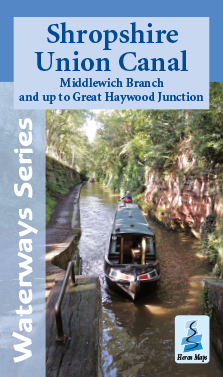 This map gives detailed coverage of the Shropshire Union Canal, including the Middlewich Branch and the Staffs. & Worcs. Canal, from Autherley Junction to Great Heywood Junction on the Trent & Mersey Canal, with emphasis on the waterways and information useful and relevant to users of the waterways without neglecting other leisure users. The map detail is complimented by information panels and photographs. The Shropshire Union Canal mainline runs from Wolverhampton, in the Midlands, to Ellesmere Port in the North-West. In between though, this popular waterway is charmingly rural. It was built using techniques developed for railway construction, utilising deep cuttings and high embankments, allowing for a straighter, more direct canal requiring fewer locks. Some notable places along the way include the medieval market towns of Market Drayton and Nantwich with their half timbered buildings. Just south of Nantwich, at Hack Green, is a former secret nuclear bunker. There are delightful villages such as Audlem, with its flight of 15 locks, and Brewood. Not forgetting historic Chester, with its roman walls and heritage, and quirky shopping 'rows', dating back to the middle ages. Situated on the banks on the River Mersey and the Manchester Ship Canal in Ellesmere Port is the National Waterways Museum. A tourist map of the Shropshire Union Canal, Middlewich Branch and up to Great Haywood Junction at 1:50,000, with detailed town plans of Ellesmere Port, Chester, Middlewich, Nantwich, Audlem, Market Drayton and Penkridge at 1:12,500. The Shropshire Union Canal map is available to buy online or by telephone from our business partner, Guidepost. Click on the logo below to visit their store.